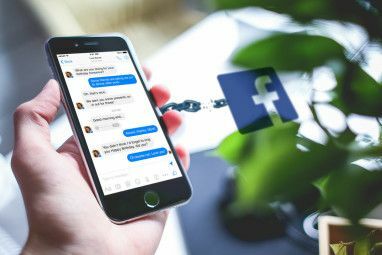 Instant Messaging has become an indispensable online tool these days, and messenger applications have therefore become popular in connecting with people. With the wide variety of programs coming out in this arena, the experience only gets better. Here are some add-ons to add additional features to your favorite chat program. 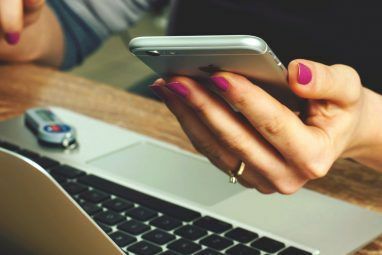 Not add-ons, really, but these multi-protocol IMs help a lot in connecting to people from various networks – you need not necessarily have to install every other Instant Messaging software around. Give them a go! 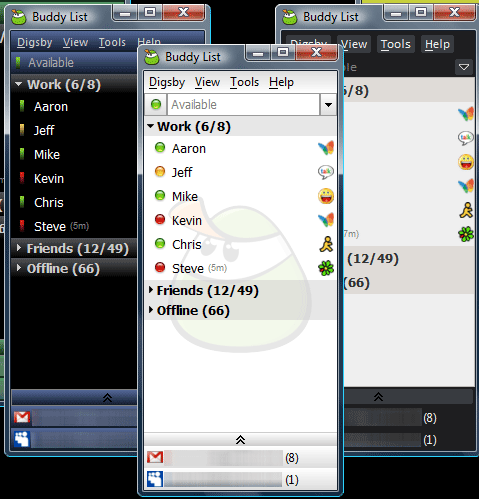 Pidgin – Probably the most popular multi protocol Instant Messaging client out there, supporting a wide number of platforms, including Skype. There a number of enhancements you could add to it, read our Pidgin Tips Pidgin - Tips and Tricks Pidgin - Tips and Tricks Read More or go to Lifehacker’s article on how to customize it. Digsby – New on the block, but doing really well. Connect to multiple messaging networks, receive emails, and even associate your Facebook account and get notifications about your Facebook contacts. You can email directly from the chat window without opening your browser. See the above screenshot. Trillian Basic – The most professional multiprotocol instant messenger, has a very skinnable user interface. AIRTalkr – Built on the Adobe AIR Platform, this is a primitive software (a bit buggy), but nevertheless, it looks very cool and you can easily keep track of what your friends are up to in a variety of social networking sites, including Flickr, MySpace, etc. Check out some more alternatives, including chat clients for mobile phones at previously posted Multi-protocol instant messengers Multi Protocol Instant Messaging Clients Multi Protocol Instant Messaging Clients Read More . 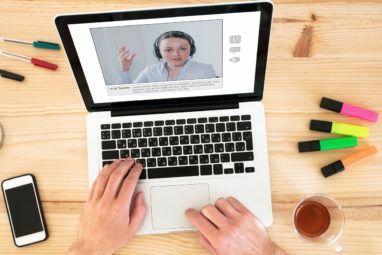 HyperIM – If you’re online simultaneously in many clients, this one is for you. This brilliant status manager and changer can work along with Yahoo Messenger, Google Talk, Live Messenger, Skype and lets you keep dynamic statuses. Uses macros and variables to set the status. Like, for example, I’m listening to %mSong% will insert the song name that’s currently playing on your media player across all instant messenger statuses. There are a wide variety of plugins you could add to HyperIM, for instance, there’s a plugin that works with uTorrent and shows off your torrent uploading/downloading statistics to your buddies. IMHistory – This tool is in the Make Use Of directory, very very useful for archiving your chats across multiple IMs online so that you can access them from anywhere. It also comes highly recommended by Mark who has used it for a long time to tame his wild chat logs. IMified – Unique productivity addon that brings lots of essential applications to your chat program (Gtalk/Jabber, AIM, MSN Messenger). Simply add IMified as a contact and you will able to access and use growing number of web applications right from the messenger window. It’s your personal assistant that can be your to do list, reminder service, calendar, Twitter client, and more. FeedCrier – FeedCrier lets you setup notification alerts for favorite feeds and get them delivered to your instant messenger. Supports AIM , MSN Messenger and Jabber / GTalk. More about FeedCrier here. [NO LONGER WORKS] Vicito – Vicito delivers latest filtered news to your instant messenger. Simply add relevant Vicito ID to your IM buddy list and tell it what keywords you want it to track and how frequently it should check for the news. MessenPass – Forgot the password to one of your messenger accounts? Recover it with MessenPass. It works with pretty much every popular IM client, and can be used to extract the IM passwords of the currently logged in user on your computer. g Always Idle – Lets you make your status idle on Google Talk (even though you’re online and using it). Extended Talk – Adds a ton of funky features to Google Talk, and you could use commands like /signout from the chat window once this addon is installed. GPlus Addon – Adds more functionality to Gtalk, like graphical smileys, and other font styling. HTML Chat Logging is a good feature. Winamp Music Status Changer – Puts what’s playing in Winamp in your Yahoo! Messenger Status Message. Yahoo Messenger Hider – Hide/Unhide all Yahoo Messenger Windows with a single shortcut key. Useful if you chat from your workplace. Works with Yahoo messenger versions 8.1 and above. For more Yahoo Messenger plugins go to Yahoo Gallery. There are plenty of user-submitted plugins there. That’s it. Let me know in the comments if I’ve missed any of your favourite tools! Im using meebo, supports many im services :), Thanks for the resources shankar. I have the BigString distructable plugin for AIM, it makes all of your messages disappear like James Bond messages!!! Very very cool. Great list! I can't wait to test Digsby Messenger for Linux :) Well done! Digsby looks pretty good (email friend's form an im window!!!). I can't wait for it to officially launch from invite only. everything looks nice...i really like the look of digsby..
is the the only way to get a code to download it by sending them an email? Download and install Digsby, during installation use the code: techmalaya to get started. I think this list is missing meebo.com. the site is a multi-IM protocol program all on a website. very nice features, and you don't even have to sign up if you don't want to. but i suggest trying it out. Cool list Shankar. Never heard of HyperIM, looks like a cool tool to try.